If you are unsure whether to invest in bond or stock mutual fund, you should consider convertible bond mutual fund. Convertible bond is a type of bond that the investor can convert into shares of company’s common stock at agreed-upon price. It also provides regular income stream. Using mutual fund, investor can easily diversify its choice in these convertible securities. 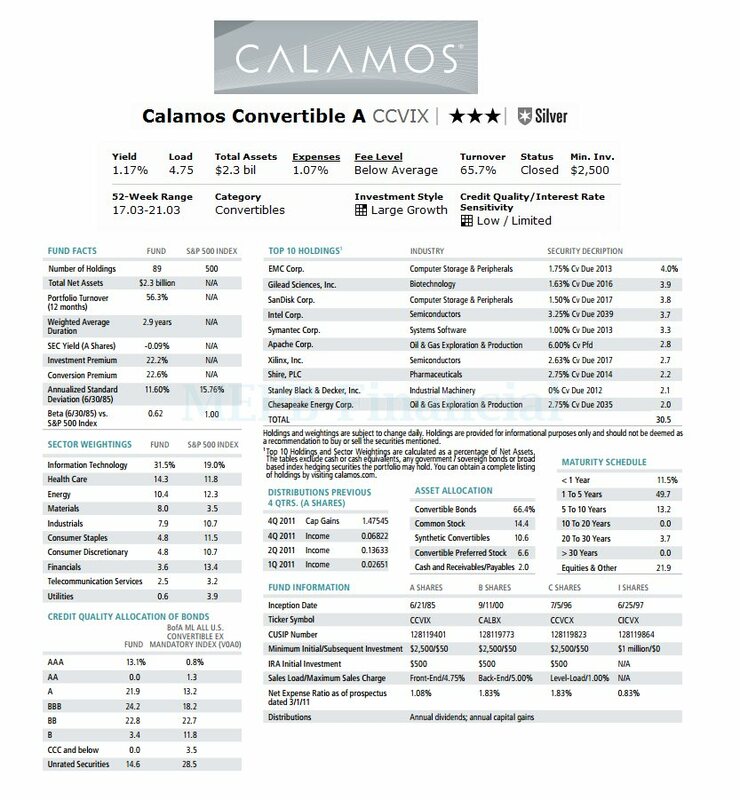 One of the top rated convertible mutual funds is Calamos Convertible fund. 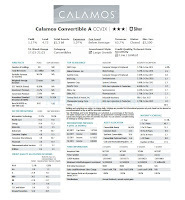 The Calamos Convertible fund’s objective is to provide current income. Its secondary objective is to provide growth. This mutual fund invests primarily in a diversified portfolio of convertible securities issued by both U.S. and foreign companies. It may invest in any market capitalization companies. The average maturity of the convertible securities purchased will usually range from 2 to 10 years. John Calamos, Sr., the founder of the Calamos Asset Management, has been managing this convertible bond mutual fund since its inception 27 years ago. This mutual fund has total net assets of $2.32 billion. Its expense ratio is 1.07%. The average expense fee in the Convertibles category is 1.23%. The fund has 65.70% annual holdings turnover as of March 15. 2012. It also has a 12-month dividend yield of 1.17%. The latest dividend received by its investors was in December 2011 ($0.07). Investors that are interested in this best convertible securities fund can open a brokerage account with a minimum purchase of $2.500. The minimum initial investment for retirement account is $500. Investors can buy this fund from 97 brokerages. They are JP Morgan, Scottrade Load, E Trade Financial, Schwab Retail, etc. The other classes of this fund are Class B (CALBX), Class C (CCVCX) and Institutional Class (CICVX). The top 10 sector weightings as of December 2011 are Information Technology (31.5%), Health Care (14.3%), Energy (10.4%), Sovereign Bonds (9.6%), Materials (8.0%), Industrials (7.9%), Consumer Staples (4.8%), Consumer Discretionary (4.8%), Financials (3.6%), Telecommunication Services (2.5%) and Utilities (0.6%). The top 10 holdings are EMC Corp, Gilead Sciences Inc, SanDisk Corp, Intel Corp, Symantec Corp, Apache Corp, Xilinx Inc, Shire PLC, Stanley Black & Decker Inc and Chesapeake Energy Corp. These top ten holdings represent 30.5% of the total portfolio. According to the fund’s prospectus, the investment risks include Convertible securities risk, Synthetic convertibles instruments risk, Foreign securities risk, Equity securities risk, Interest rate risk, Credit risk, High Yield risk, etc.